Shining their 'Speed of Light Pack' in the direction of the heritage hamlet that houses the Gloro 16.1, adidas have plastered the throwback silo with a triple blast of "Shock Blue", "Solar Red" and "Solar Yellow" taken straight from the 16+ PURE line. Wrapping their soft kangaroo leather uppers in a takeover of vibrant magnitudes, the timeless silhouette still offers that supreme comfort typical of a traditional boot. Only difference being, these are slapped up good and proper with three of the loudest palettes of paint going. Drenched all over, from the tips of the laces to the tips of the studs. Call it twisted tradition, if you must. 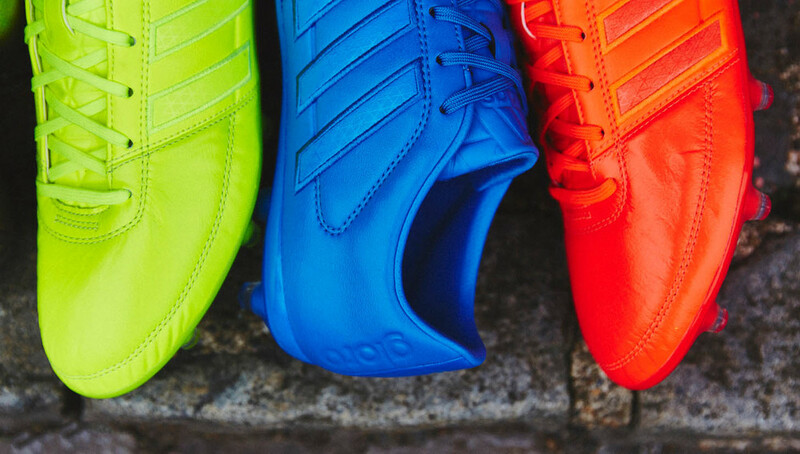 Whatever you think of it, one thing is for sure – that adidas are kicking off the domestic season in the brightest way possible, right across their entire silo collection. Vibrant vibes all round. Pick your flavour and have three scoops of late summer saturation.